A Calgary woman has been refused employment insurance (EI) sickness benefits after being diagnosed with cancer because she was on maternity leave. Jennifer McCrea, 34, had been on parental leave for eight months when her doctor told her in July that she had breast cancer. Given that she had a genetic predisposition towards the disease, McCrea decided to have a double mastectomy, which would require about six weeks for recovery. After the surgery, McCrea had difficulty caring for her baby, as she could barely lift her arms, she told the Toronto Star. McCrea went to the EI office to apply for additional sickness benefits, but the office told her she wasn’t eligible since she wasn’t available to work while on parental leave. However, a friend heard about the case of Natalya Rougas, a Toronto woman who won an appeal for EI sickness benefits, and convinced McCrea to appeal to her member of parliament — who happens to be Prime Minister Stephen Harper. McCrea was then told by EI officials that she might be able to get the additional benefits if she could show she would be unable to work when her parental leave ends and she would normally be scheduled to go back to work. “I have been paying into EI since I started working when I was 16 years old. And now they tell me I don’t get it? It’s very frustrating,” McCrea told the Star. 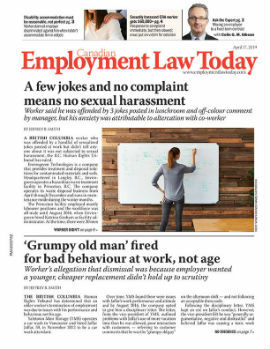 The decision denying McCrea benefits comes despite the fact Rougas won her case, in which a judge acting as an umpire ruled the EI Act intended to provide sickness benefits to women on maternity or parental leave before, during and after the leave. The judge found regulations requiring a person to be available for work should have a “more liberal interpretation” for women on leave. In the wake of that decision, a government spokesperson indicated there would be legislative changes to support the ruling. McCrea also contacted Rougas’ lawyer, Stephen Moreau, who filed an official appeal.